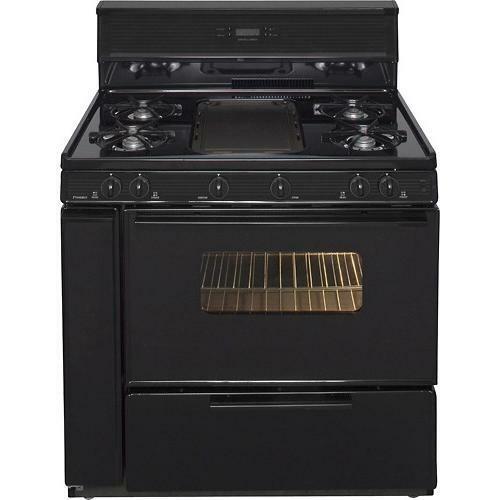 This Premier Ranges 36 Inch Gas Range comes with 5 Open Burners with Electronic Ignition and a 3. 9 cu. Ft. Manual Clean Oven with Windowed Black Glass Door and Light. This premier range comes with a 10 Inch Tempered Glass Back-guard with Clock/Timer and uses Electronic Ignition for their burners. Center Burner can be converted to Griddle. All Premier Gas Ranges can be used with Natural Gas or LP without buying conversion kits or any other extra parts. Premier Gas Range has a porcelain finish top that makes cleaning much easier. It also include heavy duty grids with porcelain finish. This Premier 36 Inch Gas Range comes in a very attractive White with Black Trim perfect to compliment your kitchen.